I have found a blog post on Electric trike mentioning some threads on BROL forum about trikes with all three big wheels. There is definetely a big demand for large size wheels on trikes as same as people want to have two 26″ or even 28″ wheels on their two wheel recumbents. Yes, it make sense to have biger wheels. They are definetely faster on flat roads and more comfortable, but I think a standard recumbent rider can hardly feel the difference. (there is bigger difference when you change from 1,5 to 1,1″ tires). Big wheels have also also some disadvantages. 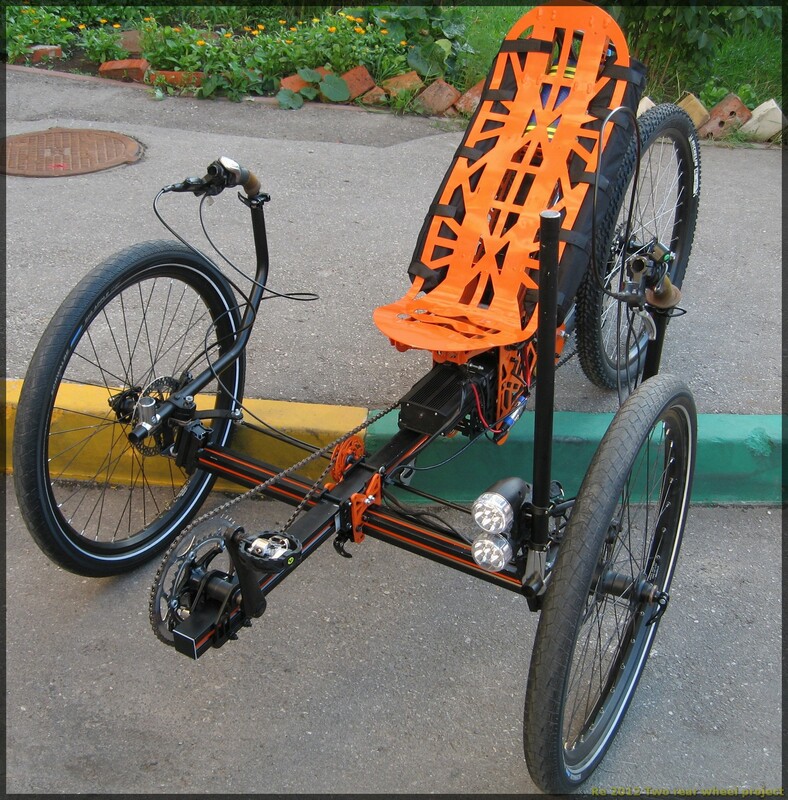 On two wheel recumbents, the bike is pretty high than so it is hard to get on and off it, it is worse to ride in difficult situations and I think that if you have less than 180 cm a suspended dual 26″ wheel recumbent is a non-sense for you. With trikes, the biggest problem is in the life time of those wheels. Bicycle wheel is simply not designed for side powers which appears when going through curves on trikes. Than the spokes loose their tension quickly and the ride is also not that stiff. Well with such carbon rims, it can be far better, but with standard width of the hub and standard rims, the properties will not be that good. Just look at the logo of Greenspeed. They had a 26″ wheel in the rear but at the moment they do not have a single model with 26″ wheel. And I take them as the trike producer which test their trikes by far the most on this planet. They were simply not happy with the behaviour of the 26″ rear wheel. At the end, I would like to say, that the pictures seen mostly here are impressive. 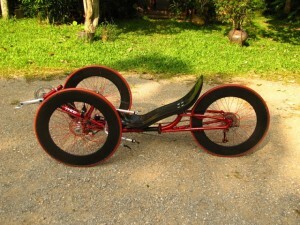 For those who want to ride really fast on their trikes, this might be a good solution, kind of road racing trike, for those looking for comfy rides during weekends, 20″ should be better. It is like a difference between super light road racing bike and some touring bike when talking about uprights. Since you linked to my blog post, I like to say something about your comment on the wheels. I have actually no problems with loosening of spokes (Sapim Leader) in my big front wheels. Sure, the 24″ front wheels are latherally less stiff than 20″ wheels, but that wasn’t a problem in the more than 4,000km I use them so far. While the 26″ front wheels with their cheap, skimpy, 18mm wide, no-name rims feel noticably less stiff than the 24″ wheels with sturdy, 30mm wide, Grossman downhill rims, they don’t pose a ride problem either. Certanly not at ‘normal’ trike speed. Since I use a fairly powerfull hub motor in my commuter trike, my rims have to endure slightly more than ‘normal’ latheral stress. Even exposing the 24″ wheel set daily to a 120° turn at 40-45km/h for a couple of weeks, often on two wheels to avoid a podhole at the apex of the corner, on my way home didn’t result in loose spokes or a wheel failure. These Grossman rims are pretty great! I wouldn’t do that with the 26″ wheels, though.